Thousands of documents that reveal in chilling detail orders from ColonelMuammar Gaddafi's senior generals to bombard and starve the people of Misrata have been gathered by war crimes investigators and are being kept at a secret location at the besieged Libyan port. The documents, some of which the Observer has seen, will form damning evidence in any future war crimes trial of the Libyan leader at theInternational Criminal Court. The court's prosecutors are expected to travel to the city to view the documents once the daily bombardments have ceased. One document shows the commanding general of government forces instructing his units to starve Misrata's population during the four-month siege. The order, from Youssef Ahmed Basheer Abu Hajar, states bluntly: "It is absolutely forbidden for supply cars, fuel and other services to enter the city of Misrata from all gates and checkpoints." Another document instructs army units to hunt down wounded rebel fighters, in direct violation of the Geneva Conventions. Plans to bombard the city are also in the archive, say investigators, who also claim they have a message from Gaddafi relayed to the troops ordering that Misrata be obliterated and the "blue sea turned red" with the blood of the inhabitants. 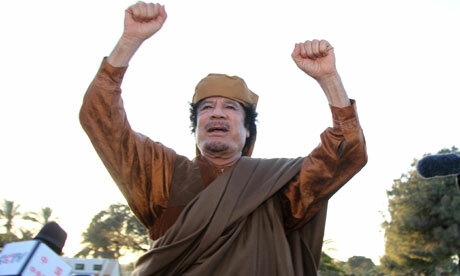 The documents are expected to form a crucial element of any trial against Gaddafi, his son Saif al-Islam and his intelligence chief Abdullah Senussi if, as is expected, ICC judges confirm indictments for war crimes and crimes against humanity that are demanded by its chief prosecutor Luis Moreno Ocampo. They represent a landmark in international justice because no significant war crimes trial in the short history of international courts has had access to documents directly implicating the lead players in the commission of war crimes. "From what we have here, the case is already proved," Khalid Alwafi, a Misrata war crimes investigator, told the Observer. "All the evidence is here. Signed and stamped." The documents have yet to be revealed to the ICC, according to the 60-strong team of Libyan lawyers who brave daily shelling to collect evidence from the city. "We are ready to show them to the ICC," said Alwafi. "They are free to contact us." The fierce shellfire that has pounded Misrata since late February has kept ICC investigators away, and the indictments so far requested deal with crimes elsewhere in Libya. The documents were saved when lawyers supporting the rebellion told protesters who broke into army bases and police stations to protect the buildings against arson. Elsewhere in the rebel-held parts of Libya, such buildings have been completely destroyed along with their contents. Government forces who surrender to the rebels are searched, and any documents they carry are preserved in case they can be used as evidence. Alwafi said that he believed Gaddafi's forces had not been ordered to destroy documents because they had not expected to be overrun. Sir Geoffrey Nice, the former lead prosecutor of Slobodan Milosevic at The Hague, writes in the Observer: "When the citizens of Misrata made the decision not to burn the archive left to them, they were certainly serving history well." Gaddafi continues to show defiance to Nato, greeting another night of heavy bombing of Tripoli by broadcasting a furious message through the capital's public address system. "Nato will be defeated," he yelled in a hoarse voice that was piped across the city. Within minutes, the emotive tones of the speech were mixed with the sound of automatic gunfire and car horns from supporters across the city. In a sign of the growing desperation felt by Libya's opposition, Ali Tarhouni, the rebel finance minister, said that they had almost run out of cash. International loans have failed to materialise and continued fighting has made it impossible to repair damaged oil installations that halted production in April. "We don't have any [cash]. We are running out of everything," he told the Reuters news agency. "It's a complete failure. Either they [Western nations] don't understand or they don't care." Nato has yet to find an answer to the Libyan dictator's defiance, with missiles continuing to fall on Misrata. "It is unfortunately still the case that pro-Gaddafi forces continue to show shocking determination to harm the Libyan people," said Oana Lungescu, a Nato spokeswoman. "It is hard to imagine the end to attacks on civilians while the pro-Gaddafi regime is still in power." Residents of Misrata hoped for just such an ending last week, when Nato leafleted government lines around the city with lurid pictures of Apache helicopters and warning of dire retribution if the bombardment continued. Since then, the bombardment has only intensified. On the streets of the shell-shattered city, journalists are now asked at regular intervals by the frightened populace: "Where is Nato?" • This article was amended on Sunday 19 June to correct the spelling of Khalid Alwafi's surname. YouTube - Sri Lanka's Killing Fields by Channel 4 [Full video]: " "
YouTube - Sri Lanka's killing fields: " "
YouTube - 'Mass grave' discovered in Libyan town: " "
YouTube - Sports' or Slave' System? : " "
YouTube - Remembering Tiananmen: " "
Ethiopia has commuted the death sentences of 23 people convicted of genocide for their part in the “Red Terror” purges during the rule of former dictator Mengistu Haile Mariam. The 23 still face life in prison. Among those spared the death penalty Wednesday are many senior officials in the Mengistu government, including former vice-president Fisseha Desta and former prime minister Fikreselassie Wogderes. The 23 were imprisoned after Mengistu’s Communist military junta collapsed in 1991. They were convicted of genocide and sentenced to die in 2008 after a lengthy trial. President Girma Woldegiorgis said he was commuting the sentences to life in prison in response to an appeal by leaders of Ethiopia’s Christian and Muslim communities. In a telephone interview, government spokesman Shimeles Kemal said all those granted clemency had expressed remorse. "There was an ongoing movement on the part of religious organizations seeking for pardon and reconciliation and considering the active repentance made by the former ex-Dergue officials and these have been submitted to the president, and by the power vested in him in the constitution, he has granted the request," said Shimeles. Thousands of the Dergue’s suspected political opponents were believed to have been killed during the military junta’s 17 years in power, many in gruesome fashion. Spokesman Shimeles Kemal called the presidential clemency a sign that time is healing the wounds of the Dergue era. "This measure shows the government has come to grips with the country’s horrendous past," he said. It was not immediately clear when the former Dergue officials might be released. Legal experts say a life term carries with it a maximum of 25 years in prison. Several of those granted clemency Wednesday have already served 20 years. Colonel Mengistu, who presided over the Red Terror, was tried and sentenced to death in absentia at the same time as the other Dergue officials. Now 73-years-old, he lives in Zimbabwe under the protection of President Robert Mugabe.